50-pin flat cable connectors. Each connector provides access to 24 channels of digital I/O. 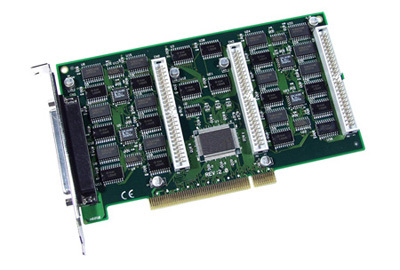 or OME-ADP-50/PCI adapter which can be fixed on the computer chassis. The OME-PIO-DIO96 can be installed in a 5 V PCI bus and supports true "Plug & Play". All boards are supplied with a standard software development kit for Windows XP/Vista/7. The software development kit includes dll files for programming in C,C++ or other high level languages and OCX files for Visual Basic or Active X programming. LabView drivers are also included. 참고: All boards include utility software and a complete user ’s manual on CD-ROM.